One of the most famous and spectacular scenery in the North-West region is the Magura cave. The MaguraCave is located about 17 km from Belogradchik and about 35 km from Vidin. The MaguraCave is one of the largest underground galleries in Bulgaria, consisting of more than two kilometres of different halls, interwoven networks of roads carved out of the very walls of limestone that climb and descent further down into the bowels of the earth. Magnificent stalactites and stalagmites cross the so called concert halls as columns, and some of them even reach twenty meters. “The Big Pillar” has a diameter of four meters at the base and the shaping of its twenty metres structure has taken thousands of years. The miracles that are hidden in the cave do not stop there – cave pearls and cave milk add lustre to this extraordinary place. Besides a creation of nature, the Magura has engraved in its stones the longest line of human history – the prehistory. 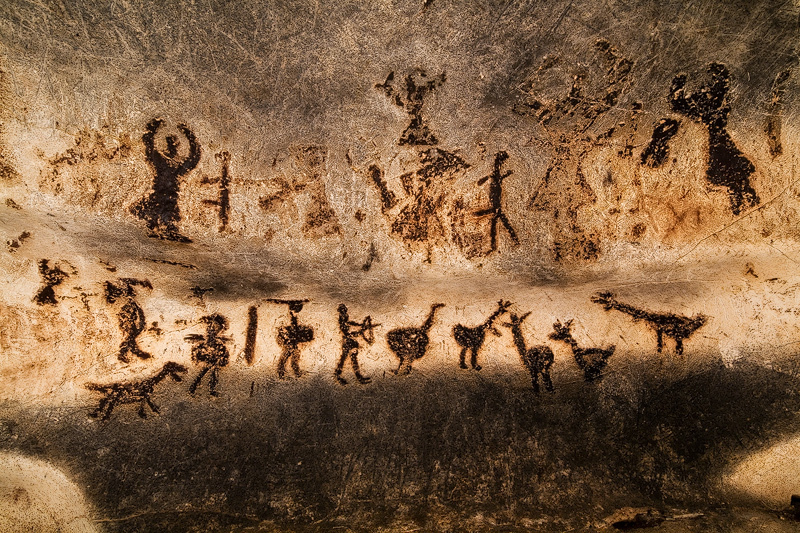 The earliest human presence has left its permanent appearance on the walls of the underground chambers in the seven hundred drawings from different eras. Nowadays the drawings created 7000 years ago can be seen in the depths of the art gallery. The paintings depict dancing women and hunting men, disguised men, animals, plants, and celestial bodies. Calendars of the solar year, with amendments cleared by the heirs of their creators, are preserved together with drawings-explanations for holidays and festivals, symbolic and real figures. This lead to hypotheses about the religious nature (even a probable operation as a sanctuary) of this part of the cave. Analogies have been made between the MaguraCave and other famous cultural centres of the Mediterranean prehistoric art found in the Apennines and the Iberian Peninsula. Unlike other rock panels, however, bearing examples of prehistoric art, the anthropomorphic forms are prevailing in the MaguraCave. The rock art is focused primarily on the role of man in the world and in society. The elements of dance depicted both on the women and some of the men comply well with the hypothesis of a sacred place or a place of religious importance, since in the tradition of pagan cults, dance often has an important role in the ritual ceremonies. The hunting scenes are remarkable, but despite the hypotheses for the religious character of this part of the cave, scenes of sacrifice seem to be lacking. The bestiary of the cave is not as complex as in other centres of prehistoric art (where on the contrary the anthropomorphic images are rare), and the theme is developed. Animals often appear as an illustration of hunting scenes, but rather rarely alone. The gallery dedicated to the petroglyphs (the rock drawings) is in one of the most inner parts of the cave, which implies the more reticent nature of the room. It is not directly visible from the central axis of the cave (the road that runs through the middle of it) and is located in one of the lateral extensions and the path leading to it is more narrow. The climatic and landscape features of the area around the Rabisha Mound are similar to the ones in the Champagne region in France, which in turn provide unique for the Balkans conditions for manufacturing and storage of sparkling wines. The constant temperature throughout the cave is 12o C, and the humidity levels are favourable. That is why in one of the cave”s interior branches the only cellar in Bulgaria for natural sparkling wine processed under a classic French recipe is located. Wine tasting is held in place.